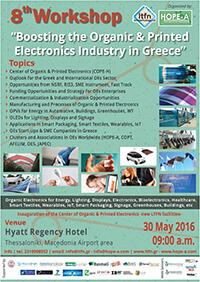 The Event will take place on May 30 2016, 09.00 am at Hyatt Regency Thes­sa­loniki Hotel. This excit­ing event will also include the Inau­gu­ra­tion of the Cen­ter for Organic & Printed Elec­tron­ics — Hel­las (COPE-​H). The Work­shop tar­gets to form the Strat­egy and Pol­icy to boost the Organic & Printed Elec­tron­ics Indus­try in Greece and beyond, with the par­tic­i­pa­tion of sci­en­tists, engi­neers, indus­trial part­ners, final users, enter­pre­neuri­als, VCs and rep­re­sen­ta­tives from national authorities. 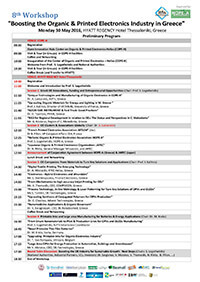 Below you can find the event’s poster and the Workshop’s pre­lim­i­nary agenda.